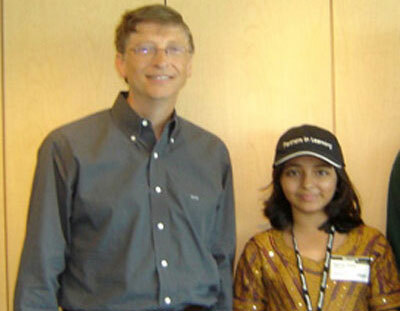 Arfa Karim Randhawa passed away at the tender age of just 16. Inna Lillah Wa Inna Elaih Rajeon! Born in 1995, she achieved celebrity status after becoming the world's youngest computer expert at the age of 9, passing a tough series of Microsoft tests designed for software professionals. Her success brought her an invitation to Microsoft headquarters in Seattle, where she met its chairman, Bill Gates, and discussed her idea for a self-navigating car in 2005. She spent the last month of her short life in a Lahore hospital after reportedly suffering an epileptic seizure and cardiac arrest. Two weeks ago her prognosis appeared to improve. In recent weeks, Microsoft stepped in to help provide expert medical care. Todd Bishop, a Seattle-based newspaper reporter covering her Redmond visit, wrote about her as follows: "She made an impression through a combination of charm, flattery and boldness uncommon for someone her age. For example, during Arfa’s meeting with Gates, she presented him with a poem she wrote that celebrated his life story. But she also questioned him about what she perceived to be the relatively small proportion of women on the campus." Arfa's untimely death at such a young age is a tragic loss for her family and for Pakistan. Her legacy, however, will live on. I hope and expect that many more Lavinashrees and Bilals will be inspired by her memory to accomplish whatever they set their mind to, including but not limited to achieving celebrity as Microsoft professionals. God bless America for the technology we use in our daily lives. Also God bless Bill Gates also for showing compassion. SAD HOW SUCH PEOPLE HAVE SUCH SHORT LIVES AND THE mullahs and other trouble makers have such long ones!! Lovely article we have really lost a beautiful soul. Hope to hear some news about economic health of Pakistan which is not all well i hear. Whats your opinion? We all love you Arfa Karim. She is the biggest lost for her parents and the whole nation. Two Canadian teenagers have sent a Lego man into space using a home-stitched parachute and spare parts found on Craigslist. Mathew Ho and Asad Muhammad, both 17, attached the two-inch astronaut clutching a Canadian flag to a helium weather balloon, which they sent 80,000 feet into the air - three times the height of a commercial jet's cruising altitude. The pair managed to capture the entire 97 minute journey which began on a football pitch in Toronto using four cameras set to take photos every 20 seconds, reports the Toronto Star. They were left with astonishing footage from an estimated 24 kilometres above sea level which showed the toy floating above the curvature of our planet before beginning a 32 minute descent back to earth. The personal project cost the boys $400 and took four months of free Saturdays, reports the Star. Having attached a GPS receiver to the styrofoam box carrying the cameras and Lego man, the teens were able to recover their Lego man which landed 122km from the launch site. When the teens got home and uploaded the two videos and 1,500 photos onto a computer, they told the Star that they started screaming with joy. Their footage shows the Lego man spinning at an altitude three times higher than the peak of Mount Everest, before the balloon bursts and he starts to plummet. “We never knew it would be this good,” Ho told the Star. According to the report, the two students met in middle school after Muhammad's family had just emigrated from Pakistan. Muhammad, who spoke no English, was soon befriended by Ho and they began working on the project at Ho's house last September. "People would walk into the house and see us building this fantastical thing with a parachute from scratch, and they would be like, 'What are you doing? ', We'd be like, 'We're sending cameras to space.' They'd be like, 'Oh, okayyyyy …' Ho told the Star. Astrophysics professor Dr Michael Reid, from the University of Toronto, praised the boys' work, telling the Star: "It shows a tremendous degree of resourcefulness. For two 17-year-olds to accomplish this on their own is pretty impressive." Qualifying to be a "Microsoft Certified Technology Specialist" is an impressive achievement regardless of one's age, but now a Pakistani boy named Shafay Thobani can boast having checked it off his to-do list at the tender age of 8, the Daily Mail and the UK's Sun newspaper are reporting. According to Shafay's personal website -- likely managed by adults, as it makes heavy use of the phrase "the child" to describe his training and accomplishments -- he started working with computers when he was just 4 years old. At the age of 7, Shafay started training to pass the exams necessary to become a Microsoft expert. Doing so meant 13 months on a strict schedule that involved attending school from 7:30 in the morning to 1:30 in the afternoon, followed by computer classes at his father's office from 2:30 to 8:30 p.m.
Becasue Shafay's father is Shah Thobani, the CEO of Thobson Technologies in Karachi, the boy had access to a 1,000 square foot training space featuring three desktops, switches, routers and laptops. Despite all those hours of work, Shafay's father and the staff who trained him didn't lose track of that fact that the boy is only 8. There was a dedicated area for chess, darts and arcade games. All that rigorous studying appears to have paid off though, with Shafay reportedly achieving a score of 91 percent. “I feel like the luckiest parent because at the end of each day I only ever receive very positive feedback from Shafay’s teachers," Shah Thobani was quoted as saying in the Sun. “Every year I give Shafay a new challenge to try and encourage him." A Pakistani student from Balochistan has bagged gold medal in an international contest held in Turkmenistan leaving all the countries like Germany, Canada, Russia, England, India, Bangladesh, Sri Lanka behind. M. Ubaidullah son of Haji Talib Din, a rice trader, is a class ninth student of Pak-Turk International Schools and Colleges, has brought home a gold medal from the International Computer Project Olympiad (ICPO) held in Ashgabat, Turkmenistan. The competition was held on September 14 and 15 among students from 45 countries who presented 150 projects in the Olympiad. Ubaidullah’s project that caught attention of participants, organisers and judges was regarding plant automation system; subsequently he was awarded 1st position in the hardware category. His project P-Bot aims at saving plants in cold-flame or greenhouse setting, especially when someone wants to protect the plants at home in all the seasons. P-Bot automates the round-the-year tasks of plant care by means of its full-automatic cold flame and greenhouse routines. Such a disheartening loss. The online community lost a protege with a potential to be a master iphone application developer or even an executive of her own software company.